Well, as I am not Celtic in any of my genes, I suppose I lack the necessary sentiments about leaving Ireland. I shall miss some excellent friends I met, Kathleen, Seamus, Father David Jones, Dave and others. However, I would not recommend a visit in the winter! I have lived in Alaska and in Alberta, and Ireland feels colder. Partly, the lack of central heating in many of the houses and the dampness accounts for some of the cold, but the Irish are, simply, hardier than I am. They can take it. I feel that it is a country "half in love with easeful Death", as Keats wrote in his great Ode to a Nightingale. In fact, a Nightingale was singing on a line at dusk only a few feet away from me. It came out of the hedge by the walk, by the field of sheep and one rabbit, and sang its amazing song. If you have never heard a Nightingale, the song is like a series of trills and whistles and is quite loud. I have heard these in England as well, years ago. Goodbye for now, Nightingale. The Examination of Edward Fitzharris. The Arraignment and Please of Edward Fitzharris. 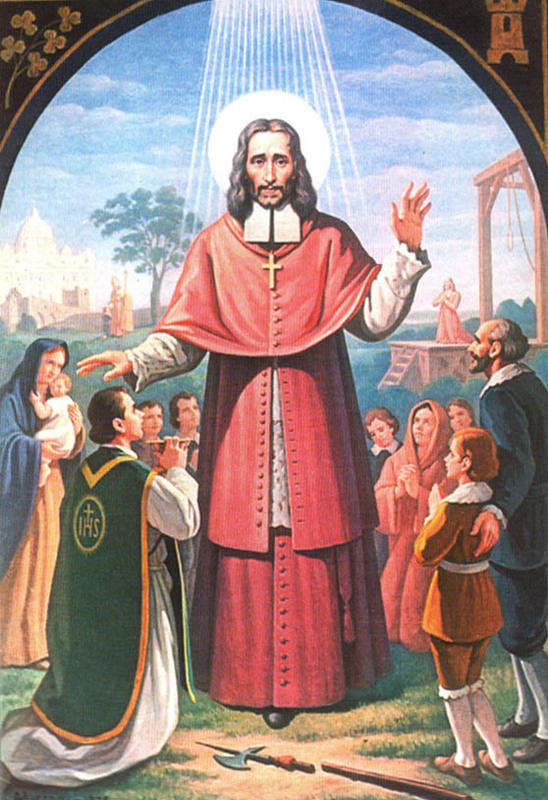 The Tryal and Condemnation of Sr. Oliver Plunket. An Answer to the Protestation of the Nineteen Lords Against the Rejecting of the Impeachment of Mr. Fitzharris. I am holding in my hands the original 1681 book, bound in white leather, as it was once presented to a Pope, given by Cardinal Conway to Msgr. John Hanly, the Postulator of the Cause of St. Oliver Plunkett, on 21 June 1976. I am honored and humbled to be able to see, old and use this book. This book, published in1681, in London, for Thomas Fox, at the Sign of the Angel in Westminster-hall, was printed by the order of the House of Commons. The Speaker of the House W. Williams ordered and approved the printing. It is made up of sections, printed at different times. It is a treasure of Catholic history. I shall lightly refer to the section on Edw. Fitzharris and the Popish Plot, returning to that in another blog, as I want to concentrate on the section relating to St. Oliver Plunket, here spelled with one t.
That Edward Fizharris was accused of attempting to kill the King, along with armies from Holland, Flanders, France and Italy, and connected with the murder of Sir Edmund Bury-Godfrey, along with so-called conpiracy involving the Duke of York and a certain Father Bedingfield is set out. Another printing from the Spring Term of 1681 carries on the trial proceedings, which obviously fall short of any fair trial as determined by Magna Carta, and this is seen in the trial of St Oliver Plunkett. There are no attempts at real information. The entire trial is printed, with all the notes regarding the Jury and all the dialogues. That the jury was “stacked” with anti-Catholics and that the Lord Chief Justice, and the witnesses convicted a man of treason for being a Catholic is clear. This sets the stage for the non-trial judgement of St. Oliver Plunket. Despite the lack of justice, I am impressed with the details of the trial proceedings and the minutiae of the notes, which were taken down verbatim by hand and then printed into the book I know have before me. The section on the Tryal and Condemnation of Fitz-Harris and Dr Oliver Plunket, were printed for Francis Tyton and Thomas Basset, Booksellers in Fleetstreet, in 1681. Francis Pemberton, the Lord Chief Justice (L. C. J. below) appointed these printers.The evidence of two witnesses were enough to have a person condemned. What one had to do was discredit those witnesses. But, of course, the condemnation was purely because of this part of the trial. Here are some of the notes regarding the witnesses. Mr. Serj Jefferies. :What Religion is Mr. Fitz-Harris of? Mr. Everard: he was always looked upon to be a Papist? Fitz-Harris: When did you see me at Mass? Mr. Att. Gen. Hath he not owned himself so? Mr. Everard. He hath owned himsrlf at several times to be a Papist. That the saint could not get witnesses from Ireland because of bad sea winds did not seem to interfere with the puppet show. Plunket defended himself, having excellent legal training in Rome. His great intelligence is seen in the transcript of the trial, and one must remember that he had been imprisoned in Ireland and in England for nineteen months before this trial. The Popish Plot for which Plunkett was supposedly guilty saw the execution of Lord Staffor, on of the five Catholic lords who had been imprisoned in the Tower in connection with the plot. He was 85 when executed and was Cardinal Howard's uncle, the family which helped Oliver Plunkett in prison. That the Protestant were allowed to hold sway over such false proceedings showed the political need for Charles II,(to whom Oliver Plunkett had written a plea or petition of freedom), to prove his loyalty to the Church of England, and Parliament. The hypocrisy of the times may be highlighted in the fact that his own queen, Catherine of Branganza, had as many as twenty chaplains housed in her palace, who she allowed and encouraged, to work in London and the surrounding areas at night, while they slept most of the day. Plunket asked for a deferral of the trial for ten days to allow his witnesses, but he was denied. The details of the trial and the so-called veracity of the two witnesses make for interesting but frustrating reading, as one knows the outcome. I shall skip to the end of the trial and the conversation between Plunket and the Lord Chief Justice. Chancellor of Ireland, my Lord Berkley, my Lord, Essex and the Duke of Ormond. Then the Keeper took away his Prisoner, and upon Friday the first of July, he was executed according to the Sentence. FINIS. On the 8th of this month I was put on trial, accused of trying to bring in the Catholic religion, of having seventy thousand men ready for a rebellion, of having collected money for them, of having surveyed all the fortresses and ports in Ireland, and of having assigned the port of Carlingford for a landing of the French. I insisted that I should have time to bring my witnesses from Ireland, but in vain. I objected that a crime alleged to have been committed in Ireland ought to be tried there also, and that the jury of twelve should be taken from there so that the character of the persons involved in the case might be better known. But all was denied to me. The chief accusers were two Franciscan relgious, viz., one McMoyer and Hugh Duffy, as well as a priest for the MacClaves. Four laymen also appeared, i.e.. two O'Neills, one Hanlon and Florence MacMoyer: these four I never laid eyes on in my life. Master MacMoyer swore that he had seen with Neil O'Neill who went to the congregation of the Propaganda, letters sent by me to Cardinal Baldeschi, Prince Colonna and the bishop of Aix for the purpose of procuring forces from abroad for an invasion of Ireland. When I brought forward the argument that it had never been known that anybody cited for a particular crime before a tribunal in Ireland should again be summoned here to be tried, it was of no avail—the judge replied that a certain O'Rourke had been summoned here and tried. I answered that this man had been declared a rebel by public edict and had been arrested in Scotland. Sentence of death had been passed against me without any hope of reprieve. Thus those who once beheaded my statue have now achieved the same object in the case of its prototype, through the agency of two of their brethren. It was Friar MacMoyer who persuaded the other friar and laymen to do what they have done. I forgive them all, and with Saint Stephen I say, “Lord do not lay this sin to their charge”. I believe I am to die about the end of this month. Please show this letter or its contents to all my friends, and beg them ardently that they pray for me. I never tried to introduce the Catholic religion except by teaching and preaching only. I have never in conscience been guilty of any conspiracy or rebellion, directly or indirectly. Oh how I wish I were are free of every other crime and sin against the divine precepts as I am of this! It is essential therefore that all my friends pray for me, as I hope they will. By the way, Msgr. 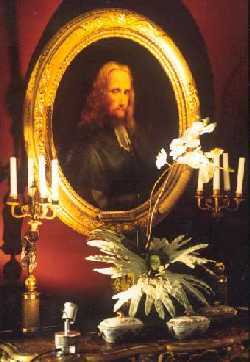 Hanly has the original painting, which is copied here, with the difference that the pike is not broken in the original, as Msgr. asked for this change when the IRA decommissioned their weaponry. This copy is in the church, at the shrine, in Drogheda. Msgr. explained to me the symbolism in the painting. Of course, St. Oliver is dressed as a bishop of his day. The children on the right represent his school which he started with his own money, under the care of the Jesuits, in Drogheda. 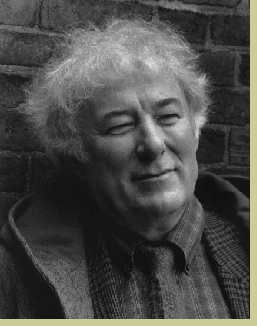 The many people represent all the thousands of Irish the saint confirmed. The priest in the front represents those men he ordained, and the renewal of the priesthood he demanded in Ireland. The ruins on the left-hand side represent the fact that Rome stands, although Ireland fell, and that the Church will last through persecution. The gallows is self-explanatory. I have spent several delightful hours over the past few days listening and discussing St. Oliver Plunkett with the former rector of the Irish College in Rome and the postulator for St. Oliver, Mgsr. John Hanly. I have discovered so many treasures in the Letters, pointed out to me by Msgr. Hanly, to now have a new perspective on the erudition and greatness of the last martyr of Ireland and England. The Letters need to be studied, not merely read, not only for the history of the penal times, and not only for the revelation of the character of the great saint, but for the insights and timeliness of the state of the clergy and education in Ireland in the 17th century. Of all the many themes, all important, I chose to highlight a few references from the Letters regarding the importance of seminary training. If I had time, I would write more on the beauty of the Letters themselves, written by a great scholar of classical education, with legal training and humor. I have been a year and seven months in this country now, and I think I have given so many reports on the spiritual affairs of my province that my superiors can almost touch with their hands and see with their eyes what its condition is, and of what temper it is. In fact, it is in many ways unwell and there is the danger that the illness may progress and become more serious, if our superiors (in Rome) and physicians-in-chief do not provide us with medicines, purgatives and preservatives. Generally speaking, the lack of learning on the part of the clergy is great, despite the fact that the Irish, and especially the Ulstermen, are intelligent and quick-witted; what us is this if their talent cannot be cultivated? May I add that the great saint was also very clear as to the heresies of the day, the aberrations of sacramental life, the laxity of the orders, and the need for catechesis. Does this sound familiar? In addition, one of the most eloquent pleas from this man was the desire for truth with regard to the lax bishops and clergy. One of his phrases, in Letter 195 notes, “As the proverb says, the blind man is no judge of colour...and thus Father..., who is himself quite ignorant, is no judge of …. 's learning. Would that the recent Visitations would be so honest. Pray to St Oliver Plunkett for excellent clergy in Ireland, a change in the seminary training to come back to the classics and to orthodoxy.